I'm sitting in one of Las Vegas' only NON-Resorts. 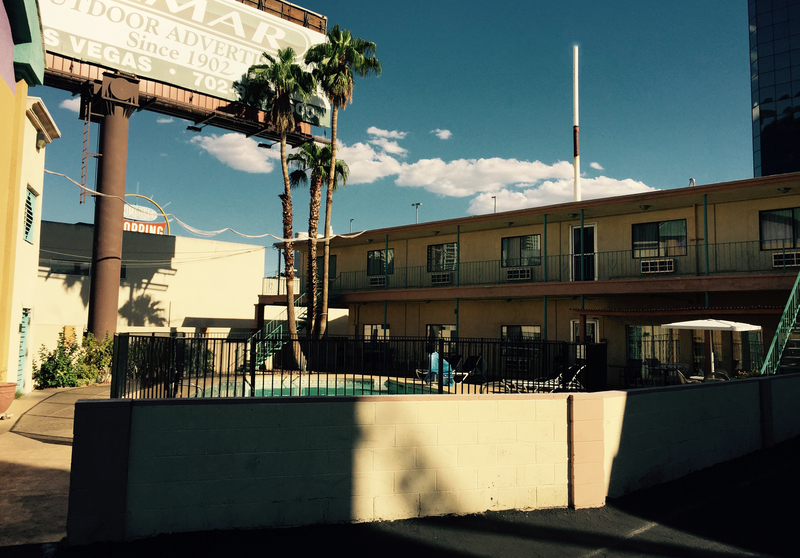 A very simple, and very old, one star property adjacent to an expansive parking lot in what can only be described as an exceedingly expensive piece of Las Vegas earth with a terrifically inexpensive property sitting on top of it. The story of how I got here over the last 24 hours perfectly illustrates how absurd (and overtly dishonest) the hospitality industry has become with their so-called Resort Fees. 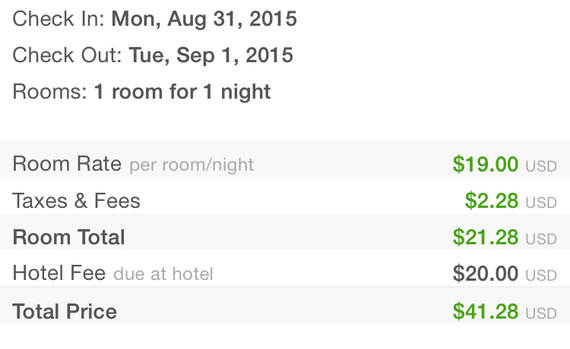 Fees designed to conceal the true price of hotel rooms against the realistic pressures of the free market. Twenty-four hours ago I set myself on a mission to find a specific type of hotel property I'd previously speculated might exist: a hotel where the room itself would cost less than the "resort fee." If you're not yet familiar with the resort fee (haven't made any recent trips of Orlando or Las Vegas), it's the mandatory purchase of hotel amenities (Internet, landline phones, pool use, parking, etc. ), whether you use them or not, which is nearly impossible to get out of paying (and quite often isn't disclosed honestly by third party booking engines). 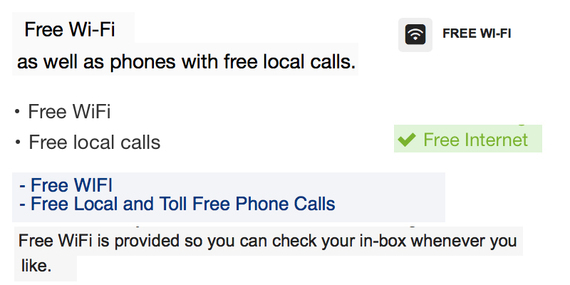 Put another way, I wanted to find a hotel claiming to charge more for the Internet and the landline phone, than for the room itself. It took me exactly 4 minutes to find such a property using Kayak, Agoda, and a very thorough article on the excessive nature of Las Vegas' resort fees. It's not important which hotel it actually was where I booked my lopsided pricing reservation, because honestly it wasn't hard to find more of them (I discovered 5 more properties pulling the same stunt in further searches), so I'll just refer to my reservation as being made at Hotel A. I used a third party booking engine that did NOT factor in the cost of the resort fee into its hotel total price calculus (this is common for third parties that want to pretend-advertise "actual costs" as lower than their competitors are offering -- if you've seen the beltless Trivago man commercials you have an idea of what I'm talking about). So I became a future guest at 3 star Hotel A in Las Vegas, NV for a total room price of $19 + tax, a bargain by anyone's standards. The true price, the honest price, of a stay for this night at Hotel A is actually $39 + tax. So why all this talk of charging more money for the use of a landline telephone, than the room the landline telephone is in? Why do hotels do this? What is a resort fee really? I'll get to these questions in a moment. It's free after I've paid for It! I took a strong stand against the resort fee, and stated because my booking didn't include the resort fee on the payment page or the "Booking Conditions" page or the "Special Conditions" page or the "Room Info" page that I wasn't going to pay it. Hotel A took an even stronger stand and told me if I didn't pay the resort fee they were canceling my reservation. I attempted to use some of the logic I've outlined here to prove to the general manager that the resort fee was, and always has been, a ruse to cloak deceptive business practices in artificial (and absurd) legitimacy. He was having none of it. 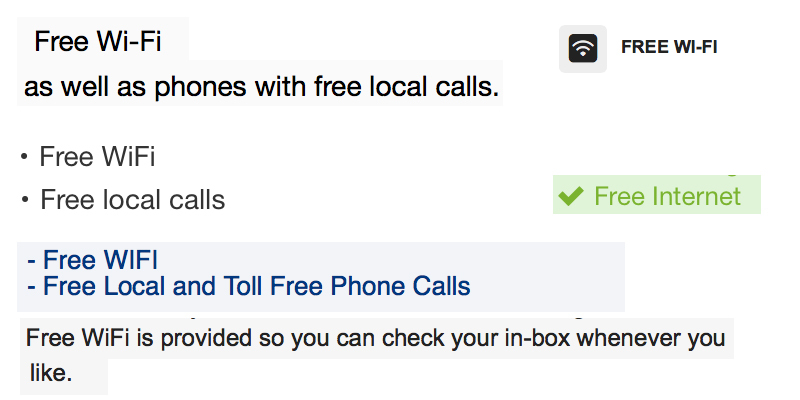 I asked him if he thought it was logical (or ethical for that matter) to value a hotel room at $19 and value the use of the Internet and landline phone at $20. He began to talk about something rarely spoken of outside inner-hotel-circles, the idea that Online Travel Agencies (OTAs) take commission, 25% in the case of my reservation. And that for a room to be profitable (or break even) the resort fee must be factored in. His utterance goes to the heart of the questions I posed earlier. 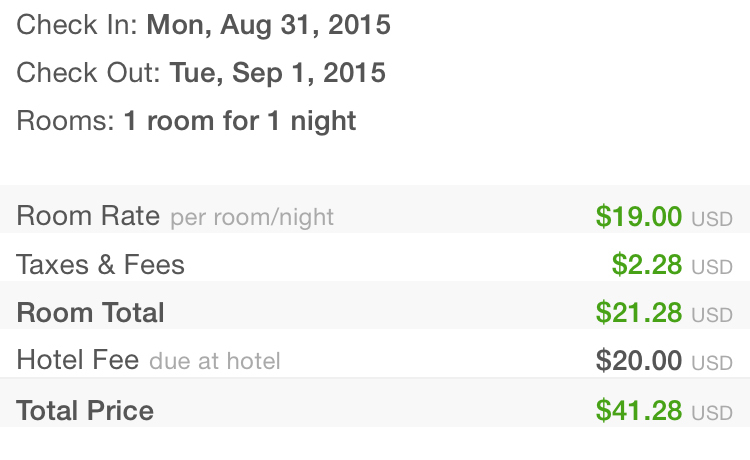 Why is there really a "resort fee" (even in cases when your hotel is clearly and obviously NOT a resort)? Hotels wanted to find a revenue stream that was mandatory (just like a paid room rate is) but that was disconnected from the sellers of their rooms, and therefore couldn't be intruded into with commissions, couldn't be factored into price comparisons, and would be very difficult for the consumer, the hotel guest, to use in the decision making process on which hotel to choose. They invented the resort fee (or more accurately, they appropriated the use of an old term used by actual resorts). They pretended it was for things like Internet, obsolete phones, pools (whether the pools were open or not), parking (whether you had a car or not), and fitness centers (whether you were a gym rat or a 300lb. coach potato); and they made every single guest pay it, no matter whether you would use any of the items on their made up list. It's probably true that the very first resort fees in the 1990s were actually at the highest end resorts, and actually meant to cover actual operating costs of actual amenities that actually cost money. But that's not how they've evolved with a vengeance in the last decade. Now they represent a lie. You can never catch a business actually admitting to the word "lie." You may find yourself surrounded with its various lower-key not-quite-synonyms: misconception, misunderstanding, error, whoopsie, difference of opinion. But for the sake of the traveling public I'm willing to go out on a limb and call the modern infestation of resort fees what they actually are, they're lies. You're paying a fee, not for the use of any useless amenity, but for the betterment of the hotel's bottom line, for the hotel's ability to evade free market economics in advertising room rates, and for the hotel to trick you into getting something you're not, and for a faux-cheaper price. An in-depth discussion of resort fee economics is tiresome, complex, and depressing. Even the description I've given here may harness the power of those adjectives, so I'll simply end with the conclusion to my story. The room is clean, the bathroom has a brand new coat of fuchsia paint on it, the breakfast is actually free, the landline phone is completely free, the parking is totally free, and the Wi-Fi I'm using to write this story is 100%, no strings attached, I promise you won't have to pay for it to use it, free! When you travel you have a choice where to spend your money (they haven't placed a fee on choice yet). You can choose to fight the resort fee by either refusing to book a property that has one, refusing to pay it, or refusing to buy (literally) into the lie. Ultimately it's your money, and no business, ethical or otherwise, can survive without you giving it to them.